I was first introduced to the pomegranate when I was a very young child. I remember my mother would buy each of us a pomegranate. Once the fruit was open, it usually took the better part of the evening getting the tiny seeds out and eating them one at a time. I think of the pomegranate as the holiday fruit. The main months for availability are November and December. When I first saw them in the market this year, I was so excited. My journey to discover more about this wonderful fruit has taken me to YouTube, the Internet, books and talking about it with my friends. The biggest challenge everyone seems to have is how to get the seeds out. One lady told me it took her a couple of hours at Thanksgiving to deseed six pomegranates. To deseed a pomegranate, first cut the top and bottom off the pomegranate. Then score in quarters making sure just to cut the skin and not the seeds. Now put the knife in the center and cut through to the edge where the pomegranate is scored. Then break it in half and then in quarters. Fill a deep pan with about 4 inches of cool water and place it into the sink. Next place the palm of your hand face up just above the water. Now, put a quarter of the pomegranate seeds down in the palm of your hand. With the other hand take a large spoon and begin to hit the backside of the pomegranate with the back end of the spoon hard enough to cause the seeds to fall out of the fruit. Continue to do this until the seeds begin to drop from the pomegranate into your hand and then into the water. After repeating the process several times and you still find a few seeds in the fruit, put the pomegranate into the water and then push them out with your finger. Repeat the process with the other quarters until all the seeds are out of the fruit. If some of the white membrane has dropped into the water, it will float, making it easy to scoop it out. Once the thin, white membrane is all scooped out, pour the seeds into a strainer and now you have a delicious and nutritious treat to enjoy. With this technique you can deseed a pomegranate in less than 5 minutes. The fruit is perfect for someone who wants high nutrition and low calories. It is high in vitamin C and potassium and is also an excellent source of fiber as well as being high in antioxidants. 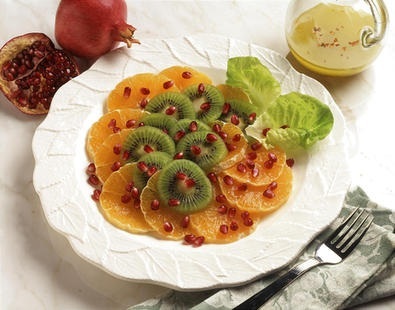 You can eat the seeds of the pomegranate, juice the fruit and use them in green or fruit salads, over cereal or with yogurt for a snack or use them for a beautiful garnish. Pomegranates can also be used for a decoration or a centerpiece. Store pomegranates like a root vegetable. Keep them in a cool, dry and dark place. Have fun exploring new and different ways to use this wonderful fruit. Need a Creative Gift that will bring hours of Fun for your Grandchildren. You will never run out of ideas when you have this wonderful set of books. Check out Dian Thomas’ Creative Books Library Special: She now had a special offer to save 60% on 5 books and 1 DVD. Get Dian’s creative library for only $40.00. Save $60 dollar and have over 25 years of her creative and amazing ideas. This package will be great for gifts, for fun, and for kids and grandchildren.. Take advantage of this limited offer at www.DianThomas.com.